A three dimensional, action-packed, Wild West board game. You buy property, hire gunmen and shoot it out in town. Will you be the fastest gun in the West? 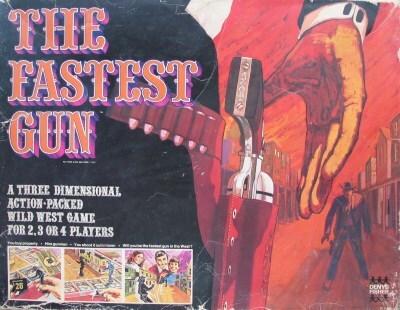 The Fastest Gun was published by Denys Fisher in 1973. This is a fantastic looking game, with a great 3D board. The gunfighting feature, which is operated by a wheel that spins underneath the board, is very entertaining and makes it a cut above the normal property trading "Monopoly type" games. The artwork on the box lid is pretty cool too, but perhaps I'm a bit biased, as this was a game I owned myself in the 1970's and I have happy memories of it! 1 set of money in denominations of $5, $10, $20, $50 and $100. The rules are printed on the inside of the box lid.